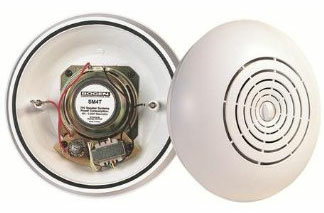 The Bogen SM4T Easy Install Speaker is a surface-mount speaker, designed to install in less than a minute. Installation is a simple, three-step process that does not require tools. First, two specially-designed studs pierce the ceiling tile. Second, two custom-designed wing nuts secure the speaker to the ceiling. Third, standard wire nuts make the electrical connection directly to the color-coded studs.